Today's smart phones feature various test menus and screens used by technicians but not publicized to the buyers or even mentioned in a manual that might run close to 300 pages in length. You can download the Samsung Galaxy manual, but it doesn't describe the test menus. The obscure codes used to access these publically undocumented features are, as we would expect, referred to as "secret codes". Let's see how to access the secret test menu on a Samsung Galaxy smart phone. One of the more intriguing ones is the LCD Test menu, accessed by using the Phone application and dialing *#0*#. As soon as you enter the final character, you will be taken to the menu shown here. This code works on Android 4. *, also called "Ice Cream Sandwich", and the older Android 2. *, also called "Gingerbread". Most of these are pretty boring. Choices red, green and blue simply turn the entire display the specified color. Use the Back button to return to this menu. The dimming choice displays all three colors dimming from high brightness to black. Most of the menu choices are self-explanatory and not very interesting. 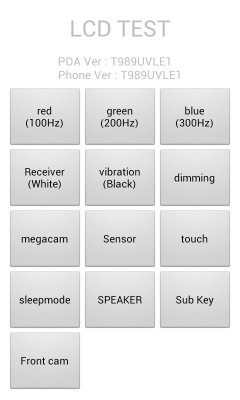 Test the vibration, test the main and front cameras, verify that it can enter and exit sleep mode. An exception is the Sensor menu choice, as seen here. 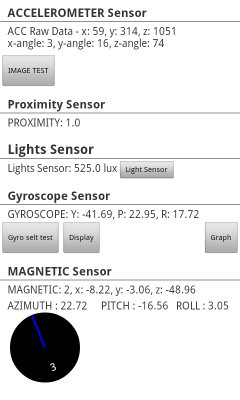 You are shown raw data for the accelerometer, the proximity sensor, the lights sensor, the gyroscope and the magnetic sensor. The numbers vary rapidly. If you receive a call while in this mode, you can still answer. When you end the call, the phone returns to this screen. 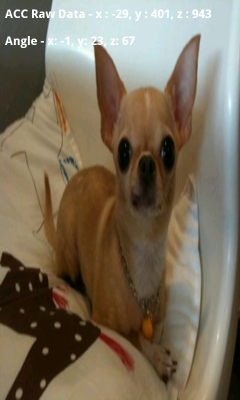 The Image Test button near the top of the Sensor Test page, between the accelerometer and proximity sensor data, brings up this picture of a Chihuahua. That's a small Mexican breed of dog. The image has been compressed horizontally. Rescaling the image to double its width yields a more reasonable looking dog. Well, as reasonable as Chihuahuas get, they're bug-eyed bat-eared dogs. Horizontal compression does them no favors. The accelerometer sensor data continues to be rapidly updated with the Chihuahua image as a background.